Preserved lemons are common in Moroccan cuisine, especially tagines, but they have many uses in a variety of dishes There are several different ways of preserving lemons or limes. Some methods involve pickling in spiced vinegar but I think that by far the best method is simply to preserve them in salt and their own juice. They will be ready to use in about 3 months and once the jar is opened they will keep for at least 6 months in the fridge, provided that the jar has a tight lid and the lemons are covered with juice/salt and they are not exposed to the air. I recall seeing a recipe from Keith Floyd using vinegar where they can be ready in about 6 weeks - salted for 10 days, then pickled in vinegar for at least 4 weeks. I think the recipe is in "Floyd in Spain”*. I cannot find a copy but I recall he used the recipe on one of his television programmes. As there are restrictions on carrying liquids on the plane I couldn’t bring them home and left them for a future visit or for others to use. But, despite having only hand luggage with a weight limit of 10 kilos I did buy another 2 kilos to bring home and a 2 kilo bag of sea salt. The proportions of lemons and sea salt are variable – just use as many lemons as you want and as much salt as you need. You will need glass jars with tight fitting screw top lids or Kilner jars. It is important to use natural sea salt and not table salt which has additives. You don’t have to buy expensive branded sea salt. Shop around. It’s the same kind of salt you would use for encrusting a fish for baking – but make sure it is salt for cooking. Wash and dry the lemons. Cut off or trim any hard piece at the stem end or nib at the top. Make a cross cut in the top and cut down to within 1-2 cms of the base. Mix half the sea salt with the coriander, black pepper and fennel (if using). Put a dessert/table spoon of salt in the bottom of a sterilised glass jar, enough to cover the bottom. 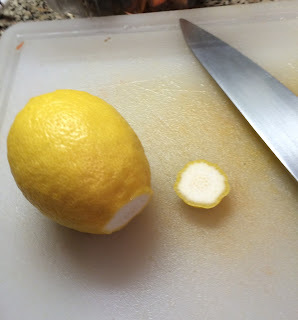 Open up the cuts in a lemon and put in a teaspoon of salt, close it and place it in the jar. Sprinkle over some more salt and then repeat with another lemon pushing down hard to release juices. Repeat this pressing down the lemons at each stage and adding more salt until the jar is full of lemons. Whilst packing the lemons add a cinnamon stick and 2 bay leaves to the jar and dried chill if using. The level of salt and juice mixture will probably come about half to three quarters up the jar. 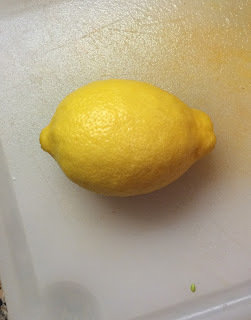 At this stage some recipes suggest adding water which has previously been boiled and more salt until all the lemons are covered but if you have enough lemons I think it is better to add more lemon juice and salt. IF you squeeze lemons for the juice, don’t throw the squeezed lemons away. Cut the peel into shreds and add to the jar. Screw the lid on tightly. 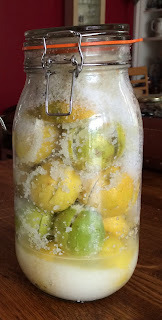 For the next 2-3 days push the lemons down each day, and shake or invert the jar and add more freshly squeezed lemon juice or salt if needed to ensure they are fully covered. Leave in a cool dark place for 1 month, when the lemons will be ready for use. It is helpful to turn the jar from time to time and ensure there is a layer of salt at the bottom of the jar – if not add more. Unopened the lemons will keep for 18 months – 1 year. Once opened, they should keep for up to 6 months in a refrigerator. Once opened you can add a little olive oil which will float on top to ensure air doesn’t get to the lemons and this will prolong the life. The preserved lemons add an exquisite flavour to chicken, lamb and fish. They can also be added to pasta dishes or mashed potatoes, salads or to liven up a serving of buttered carrots in fact to anything which could benefit from a lemony tang. But a word of warning – go easy on salt seasoning if using preserved lemons as they will give up some saltiness to the dish. You can always add more salt but you can’t take it away! To use, take a lemon from the jar. If you don’t need all of it just cut it in half or quarters and put back in the jar what you don’t need, ensuring it is covered in salt/juice. Take the lemon that you want to use and scrape off all the flesh and discard – it is only the peel that you need. Having removed the flesh, wash the peel to remove any excess salt and then slice thinly or chop according to your recipe.